Urban Land Conservancy purchased the vacant Thriftway building in 2014. Later the same year, ULC demolished the building to pave the way for future redevelopment. Immediately following the demolition, ULC started working directly with Westwood Unidos, a resident led neighborhood collaborative. Together with local community members, the two determined what interim use would be best for the neighborhood. In 2016, following a intensive community engagement process, ULC completed the construction of an interim pocket park and futsal court on the property. Long term plans for the site are to create a beneficial development to directly address the needs of the community. Through a future community engagement process ULC will create a catalytic neighborhood asset for Westwood residents. 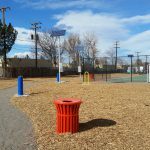 The playground, which was funded through a grant from Wells Fargo’s NeighborhoodLIFT program, was constructed in just one day! Check out our latest video featuring the Westwood community during the Thriftway Pocket Park and futsal court’s grand opening celebration! ULC, community partners and local Westwood residents joined together to celebrate the grand opening of the Thriftway Pocket Park, which will serve as a temporary space for community use in the heart of Westwood. Thank you to everyone who participated in the volunteer day on Saturday in Westwood! The futsal court is almost complete! Mayor Michael Hancock, Councilman Paul Lopez, Denver’s Office of Economic Development and community stakeholders tour City investments made in Westwood – including ULC’s Thriftway project!